Guy Shows A Gorilla Photos Of Other Gorillas On His Phone. His Reaction Will Melt Your Heart! 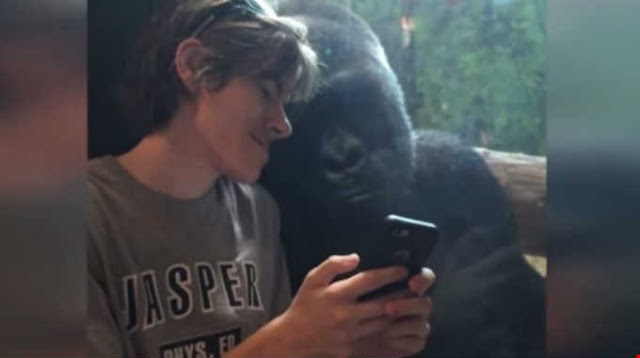 Home » other » Guy Shows A Gorilla Photos Of Other Gorillas On His Phone. His Reaction Will Melt Your Heart! We take animals out of their own homes and put them in these prisons for our own entertainment. We justify that by thinking they’re just animals, they’re not sentient, but time after time videos like this show that they’re not that dissimilar from us, and that particularly goes for big apes. This visitor of the Louisville Zoo made a fantastic contact with a resident silverback gorilla named Jelani. He started showing him photos of other gorillas in his iPhone and that caught his attention. The end of this video made me realize how much humans and gorillas are alike and I couldn’t help but feel sad they were separated by a cold pane of plexiglass.